Navia Dratp (apparently the "t" is silent), is one of those games that I was bound to love. 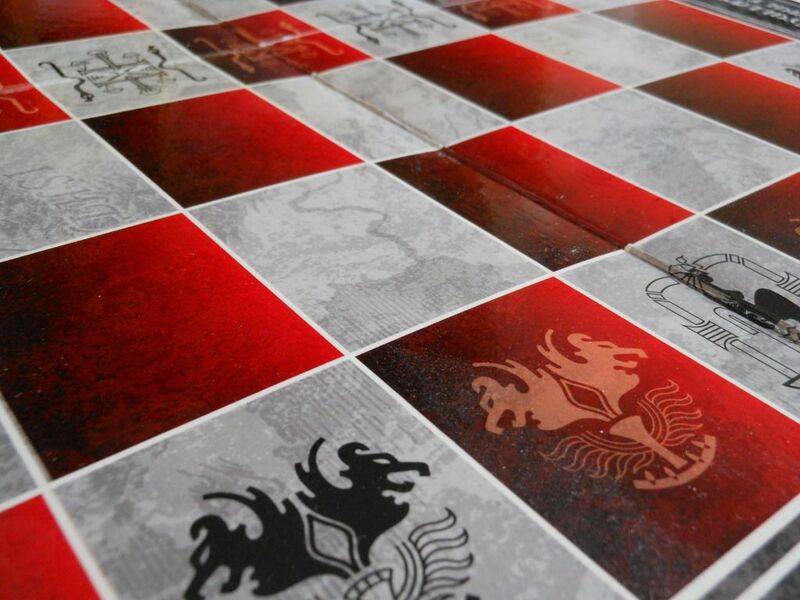 It is a Chess variant that features cool miniatures and multiple paths to victory. What's not to like? Well, there is one major thing not to like. The game is collectable. That means, after you have bought the base set, you need to buy packs of additional figures if you want to explore everything that the game has to offer. Of course, the additional figures are blind packaged, promoting the necessity to spend lots of money to get lots of figures you don't actually need. 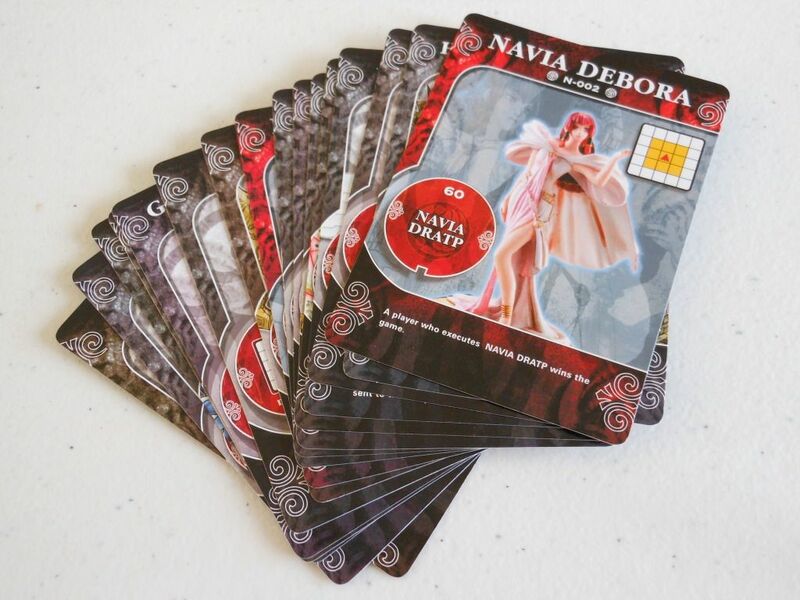 Luckily, Navia Dratp managed to avoid some of the pitfalls that most collectable games suffer from, by providing starter sets that provide a full game experience right out of the box. Yes, it is true that if you don't own all the different pieces you can't take full advantage of the rules for drafting your own armies to play with, and you will be missing out on certain elements of the game. And yes, it is true that sometimes you will want to play a certain powerful character but can't because you don't own the right playing piece. However, the two starter set armies are well balanced and lots of fun. Playing with just those pieces will provide endless hours of entertainment, and as long as you aren't playing against someone with the full range of characters to select from, you won't really feel like you are at any particular disadvantage. For the sake of full disclosure: This game was bought for me by my wonderful wife for a Christmas present years ago. 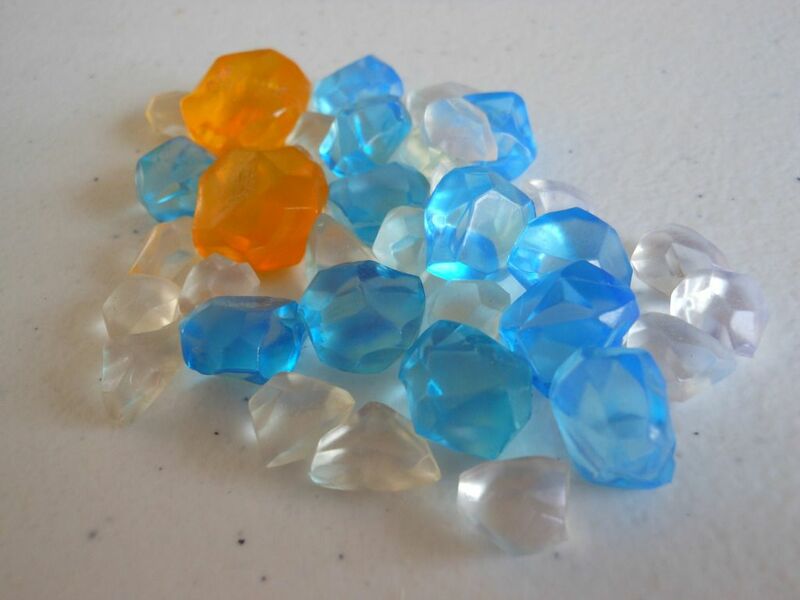 She bought the two separate starter packs, which each contained a Navia (king piece), seven Maseitai (powerful warrior pieces), nine Gulled pieces (like the pawns from Chess, but more powerful), a bunch of plastic crystals (called Gyullas), rules, reference cards, and a board. The game was also available as a two-player set featuring all the contents of the two starters in a single box, and that is definitely the recommended why to pick up a copy. 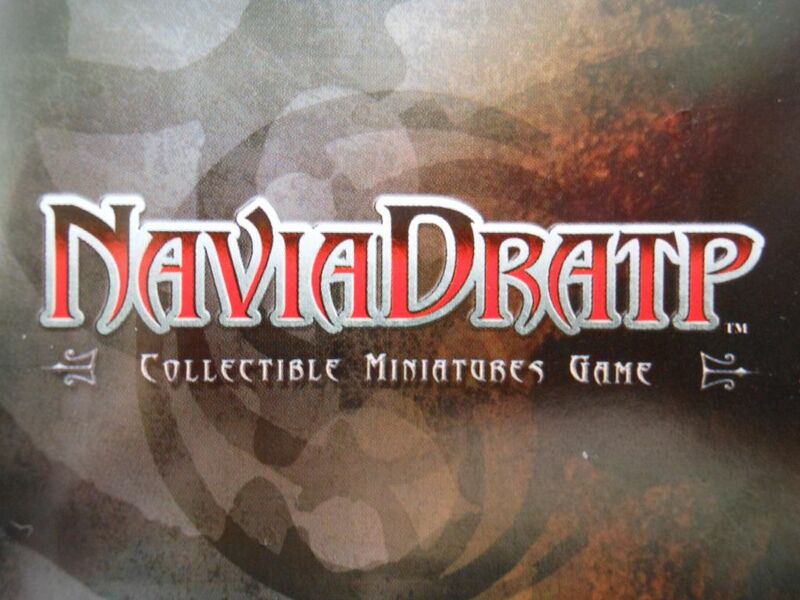 Although I loved Navia Dratp from the start, I found it difficult to find anyone to play with, and it languished in the back of the games cupboard for years. I recently dusted it off to play against a friend who I have gradually been introducing to board games, and playing it again reminded me what a truly exceptional game it is. This is a game that definitely deserved to be far more successful than it actually was. The Navia Dratp board. Subject to a bit of warping, unfortunately. If the game is so good, you might be wondering why it didn't do better. I think that comes down to several things. First, it's a collectable game, and that will immediately put people off. Second, it's a Chess variant with simple rules but very deep strategy. The use of the "toys" (plastic miniatures) might have put off serious gamers looking for a deeply strategic game, while the complex strategies and multiple paths to victory might have put off younger players who might otherwise have purchased the game for the cool playing pieces. A third reason is likely to have been all the stupid in-game terms such as "Maseitai," and "Gyullas." People want to play games; they don't want to have to learn a new language just to know what's going on. However, the biggest reason for the game's failure is probably down to a lack of decent advertising. I never even knew the game existed until it was already out of print, yet as soon as I discovered it, I badgered my wife until she bought it for me. Anyway, that's enough about why the game didn't succeed; let's talk about why it should have. The game is framed around Chess, so pieces will move around a grid based on their unique movement styles, and will take enemy pieces by landing on them; but for every similarity to Chess there is a host of really interesting mechanics that make this game fresh and exciting. 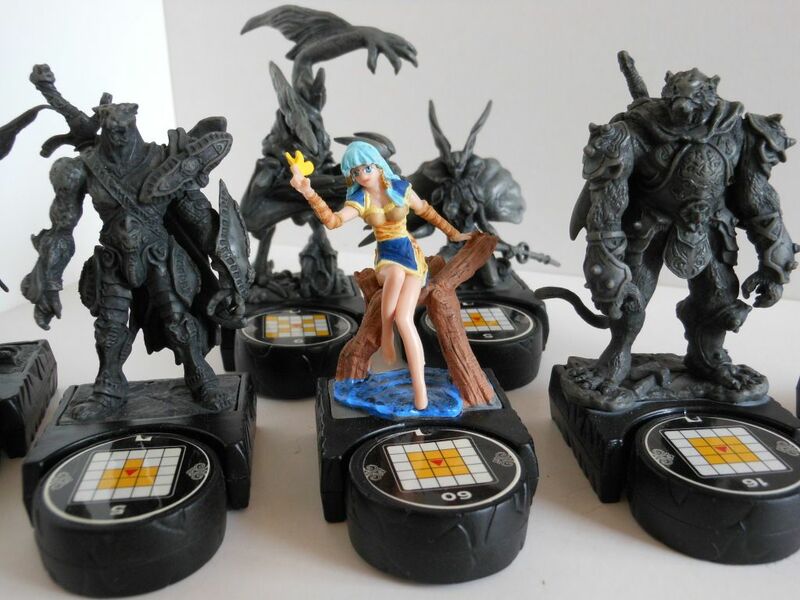 Each player has a Navia piece (a nicely painted female character who has the power to control the Maseitai), who will start on the board surrounded by Gulled pieces. The Navia is the most important piece, and if she is ever in a Check Mate position, then you immediately lose. Killing a Navia is one of three unique ways to win the game. Navia Estelle. Don't look into her eyes. The Gulled pieces come in two flavours. Black Gulled can only move forward one space, and each time they do they earn one Gyullas, which the owner of the Gulled piece will store for later use. Red Gulled can move into any of the three spaces directly in front, and each movement earns three Gyullas. 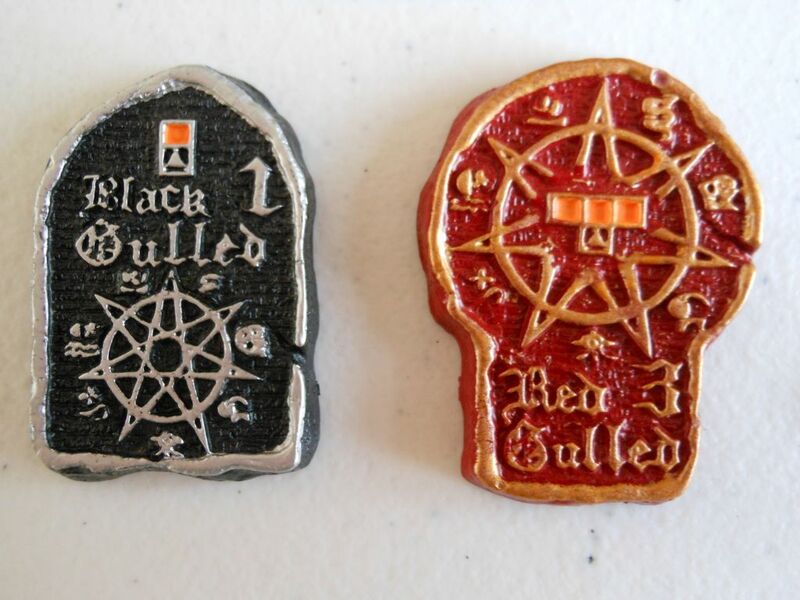 Obviously, the red Gulled are much more powerful, but you only get two of them compared to seven of the black Gulled. Each player will also have seven beautifully sculpted Maseitai pieces, which begin the game in "The Keep" at the edge of the board. This game was made by Ban-Dai, and their experience in the toy industry shines through in the quality of the Maseitai. They really are some of the finest pieces for a game I have ever seen. Estelle with some of the gang. The reason you will want to mix and match the Maseitai is because they all work differently. Every piece has a compass dial on the front of its base which indicates its movement range. Some pieces can move diagonally, some only forwards or sideways. Some can even move backwards. However, to begin with, no Maseitai can move more than two spaces in any one direction. Now, here's the clever bit: Also printed on the compass face is a Dratp value. By spending Gyullas equal to that value, you can Dratp the piece, which involves spinning the compass 180 degrees so the reverse face is showing. This second face will show a new movement grid or a special power, which the Maseitai can now use. For example, the powerful tiger Maseitai Agunilyos starts out being able to move a single space in any direction. If you pay 16 Gyullas, you can flip his compass to reveal an extended movement grid that allows him to move an unlimited number of spaces in any direction (the same as the Queen piece in Chess). Agunilyos... Stupid name, but don't tell him that. The Maseitai Olip starts the game being able to move one space orthogonally. After paying the Dratp cost of four Gyullas, he can still only move one space orthogonally, but at the point he Dratps he can switch the position of any two allies on the battlefield. 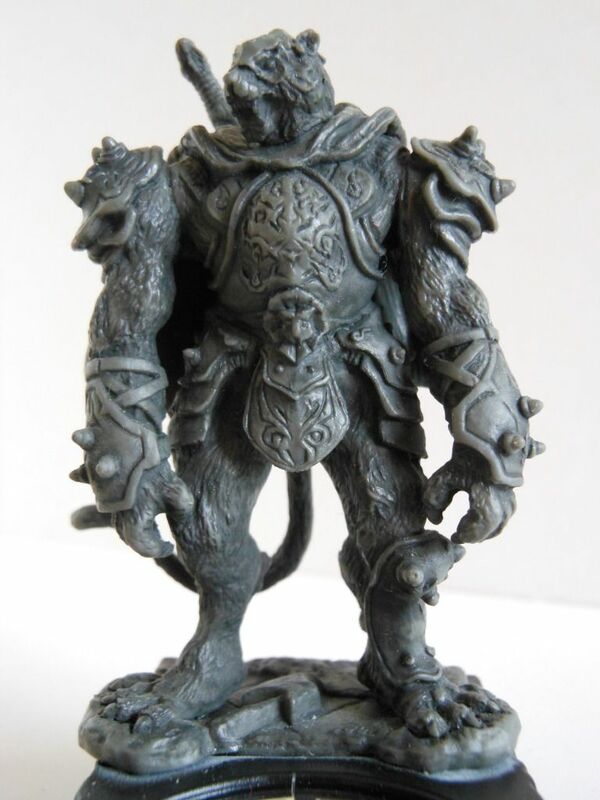 My absolute favourite piece is the Gyullas Turtle (who turned up in my review of Gormiti: The Trading Card Game yesterday). This piece has the same movement pattern as a red Gulled piece, but after Dratping, each time he moves he generates six Gyullas (normally, only Gulled pieces can generate Gyullas from moving). This is massively powerful, as Gyullas not only provide the means to Dratp your characters, they also provide the second route to victory: If you ever obtain 60 Gyullas, you can use them to Dratp your Navia piece, which causes you to instantly win the game. Enough Gyullas to Navia Dratp twice! This Dratping mechanism is the heart and soul of the game. Not only is it wonderfully implemented on the pieces, but it also creates a wealth of exciting possibilities in any game. 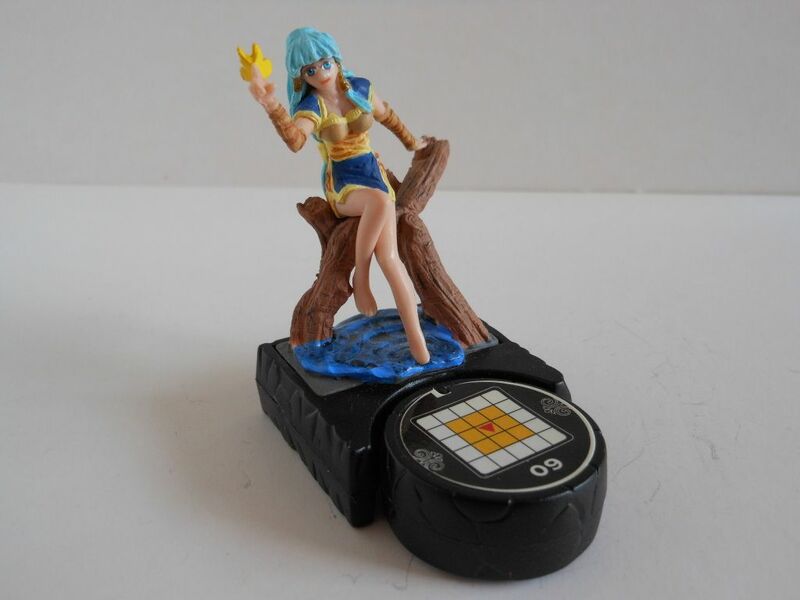 The Dratping cost of each piece also creates amazing balance. The pieces that have the most powerful Dratp abilities have the highest Dratp cost; this means it takes a long time to save up the Gyullas to activate the power, and activating the power will also mean it will take longer for you to accumulate the 60 Gyullas needed to Dratp your Navia. Furthermore, in an interesting twist, whenever a Maseitai is killed by your opponent, your opponent will gain Gyullas equal to the Dratp value of the killed piece (even if the killed piece had not yet Dratp!). For example, if you bring Agunilyos into play and foolishly allow him to be killed, your opponent will gain 16 Gyullas! If you had already Dratp him at the cost of 16 Gyullas, that would technically put you 32 Gyullas behind, and probably in a position where it would be unlikely you could win. Bear in mind, Agunilyos is really quite weak until he has Dratp, so if you bring him out too early, your opponent could score an easy 16 Gyullas by picking him off. Put another way, you have to carefully judge if you really should Dratp a Maseitai, or even if you should summon it into play in the first place. This system means you really have to think about how you balance your forces. If you put all powerful characters in your army, you will only rarely get to Dratp them; but if you only use Maseitai with low Dratp costs, then you will find yourself facing much stronger opponents who will pin down your movements and make it hard for you to win. 1. Move a Gulled piece. 2. Summon one of your Maseitai from The Keep to one of the marked summoning spaces on your side of the board. 3. Move a Maseitai or Navia already on the board, and then Dratp one of your Maseitai. A close up of some summoning spaces. Summoning a Maseitai to the board is free, but takes up your whole turn, and this creates even more tension and tactical decisions. The Maseitai are your powerful pieces, and you want them in play; but to begin with you will only have a few spaces to summon them to, and you don't want to bring them out until you really need them or they might be killed, gifting your opponent with Gyullas. Also, if you spend each turn bringing out the Maseitai, you will find you do not have enough Gyullas crystals to perform Dratp actions. A Navia piece can only move one space at a time, and will quite often remain hidden in your back line. However, there is a third route to victory, and that involves running your Navia off your opponent's side of the board. You will only rarely get a chance to win this way, but its nice to have the option. I really enjoy Chess, and I even collect Chess sets, so this game appeals to me. 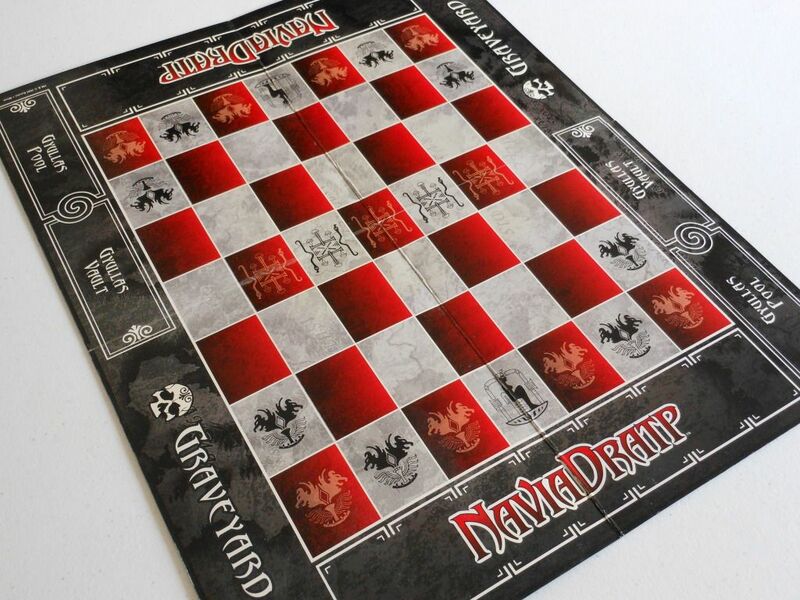 However (and I may be burned at the stake here), I actually enjoy Navia Dratp more than Chess. It has simple rules, incredible depth of strategy, and beautiful playing pieces. It's an abstract game with multiple paths to victory that also feels totally thematic. Each Maseitai works completely differently, and tinkering with combinations to see how they work together provides endless replayability. It's just a shame Ban-Dai decided to go down the collectable route, as I would love to be able to have a few more Maseitai to pick from. You give reference cards to your opponent, so there are no nasty surprises. Of course, you will have realised by now that I have no intentions of kicking this game out of The Vault. It remains one of my all-time favourite two-player games, and a shining example of quality game design. Thanks for visiting and for taking the time to comment. I really appreciate it. One of my favorite games as well I just bought my third set and have most of the other figures. I've just stumbled upon a post about this game somewhere on the internet. Seems like a nice game, dumb names tbh, but still sounds like it would have been alot of fun to play. Shame it didn't make it though. Thanks for stopping in. Yes - the names of absolutely everything in this game are pretty silly. It is a superb game though (even with just the starter sets). The turtle is my favorite too!